We’d love your help. 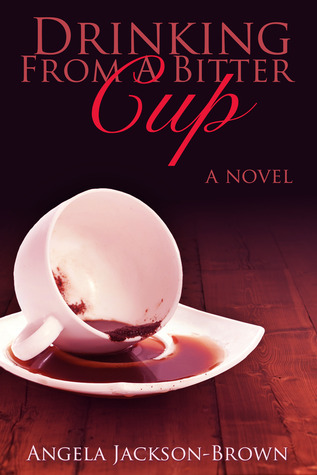 Let us know what’s wrong with this preview of Drinking from a Bitter Cup by Angela Jackson-Brown. After the death of her mother, Sylvia Butler’s father, a man she knows only from an old photo, takes her from Louisville, Kentucky to Ozark, Alabama to live with his family. But his wife resents everything about this intruder, from her out-of-wedlock conception to her dark skin and nappy hair. When the wife’s younger brother Charles returns from Vietnam, Sylvia thinks she has found a friend and confidante, only to be hurt again, but this time, in a manner she never could have imagined. To ask other readers questions about Drinking from a Bitter Cup, please sign up. This is the first book in a long time to take me through the range of emotions I felt. I laughed and cried so much reading Drinking from a Bitter Cup. Sylvia truly was a very strong young lady. I was filled with so much hope for her by the end of the book. This is a story that tugs at your heart. Sylvia went through so much and didn't completely break. Her trials made her strong. Emotional book. Great book. Wow! What a fabulous story. It's been a long time since I've come across a "can't-put-it-down" book. I instantly fell in love with Sylvia, and I wanted to reach into the pages of the book and bring her home with me. Her sweetness, strength and resilience in the face of soul-crushing devastation, which no child should ever have to go through, was heart-breaking but inspiring. Ms. Jackson-Brown did a wonderful job developing the story with a great cast of supporting characters, none of which, ever h Wow! What a fabulous story. It's been a long time since I've come across a "can't-put-it-down" book. Ms. Jackson-Brown did a wonderful job developing the story with a great cast of supporting characters, none of which, ever hit a wrong note. Endearing, uplifting, sad, hopeful, scary, infuriating, suspenseful, horrifying, heart-breaking, and ultimately, satisfying is the journey Ms. Jackson-Brown took me on with Drinking from a Bitter Cup. I enjoyed every minute of it. My only gripe is with the cover of this book. I understand the meaning, but I don't think it conveys any connection to Sylvia and her gripping tale. Beyond that complaint, this is a story well-worth your reading time. This novel kept me on an emotional roller coaster. I laughed, I cried. I cried a lot. The hardships that Sylvia faced in this story are things nobody should ever have to face. But she gives hope to anyone who has. Things get better. Don't let life get you down. Keep on living. This book has helped me in a time of emotions. I connected on too many levels with this fictional character and I can only hope to continue my life with half as much courage and hope that she demonstrates in the end. Thank This novel kept me on an emotional roller coaster. I laughed, I cried. I cried a lot. The hardships that Sylvia faced in this story are things nobody should ever have to face. But she gives hope to anyone who has. Things get better. Don't let life get you down. Keep on living. Thank you Angela Jackson-Brown for allowing this amazing story to be read - by myself and any other person who has ever felt any of the emotions Sylvia has felt: loss, uncertainty, confusion, love, etc. I'm so very glad that I have had the opportunity to read this wonderful story and to know the woman who wrote it. Thanks for being my professor and thank you for being such a wonderful woman. I would recommend this novel to everyone. It deals with some very tough topics, but life is tough and things like this happen everyday. Powerful, but I'm not sure I liked the message or the ending. Heck, I'm not really sure I liked the book. There are a lot of themes explored here about families and family dynamics,(view spoiler)[ what constitutes family, religion (Christian hypocrisy), marriage fidelity and resentment, and mental illness, nature vs nurture, sexual abuse (hide spoiler)] etc. All through the eyes of a little girl. It is well written and you really do become attached to Sylvie. She was indeed drinking from a horri Powerful, but I'm not sure I liked the message or the ending. Heck, I'm not really sure I liked the book. There are a lot of themes explored here about families and family dynamics,(view spoiler)[ what constitutes family, religion (Christian hypocrisy), marriage fidelity and resentment, and mental illness, nature vs nurture, sexual abuse (hide spoiler)] etc. All through the eyes of a little girl. It is well written and you really do become attached to Sylvie. She was indeed drinking from a horribly bitter cup. I confess I was baffled by all the reviews that spoke of courage and hope in the main character. By the end of the book I saw her future as pretty bleak. I found her circumstances and this book ultimately depressing; but one reviewer said something that provided clarity. (view spoiler)[She said that [paraphrased] through all of the turmoil, Sylvie remained of the same character and spirit. None of the circumstances robbed her of her innate goodness and spirit. (hide spoiler)] That rang true and that is where I see the hopefulness of this novel. The book seems realistic but be warned, it is quite raw, harrowing and haunting. Ms. Jackson-Brown's debut novel, Drinking From a Bitter Cup, pulled me in with the first sentences: "1978. The year I turned ten and the year my mama killed herself." And, as only happens with the best books, I couldn't stop reading and yet I didn't want the novel to end. The characters are complex and unforgettable, the story hauntingly told from the first person point-of-view of Sylvia Butler, beginning at the age of 10, filled with yearning, kindness, and reverence. Before her mother, Rose, Ms. Jackson-Brown's debut novel, Drinking From a Bitter Cup, pulled me in with the first sentences: "1978. The year I turned ten and the year my mama killed herself." And, as only happens with the best books, I couldn't stop reading and yet I didn't want the novel to end. The characters are complex and unforgettable, the story hauntingly told from the first person point-of-view of Sylvia Butler, beginning at the age of 10, filled with yearning, kindness, and reverence. Before her mother, Rose, kills herself, she tells Sylvia, "Don't love anybody too much. Keep just a little back," advice she doesn't understand at the time, but learns the full meaning of only too soon. Drinking From a Bitter Cup is full of heartbreak and hope, told with a compelling voice. There are so many memorable moments, such as one of my favorites, where Sylvia's father speaks of her mother Rose's singing voice: "She could cut you open with one note and sew you up with another." The same could be said of Ms. Jackson-Brown and her powerful novel. This book grabbed me from the beginning. I felt so many emotions with this book. I wanted to laugh, cry, and scream with anger with each turn of the page. Sylvia really drank from a bitter cup and it was amazing to read her heart wrenching story. I'm glad I decided to read this book. I was not disappointed at all. I was immediately hooked. Sylvia was so complex and she described her world so vividly that a couple of times I had to check whether the author had based this book on her life. I really felt like I was seeing the world through a 10 year old's eyes. Sylvia's description of her sexual abuse was poignant; her confusion pulled at me. I feel like the book kind of ended in limbo though. I wish we could see what happened next with the characters. I kept waiting for Mother Viv's redemption, but I guess I was immediately hooked. Sylvia was so complex and she described her world so vividly that a couple of times I had to check whether the author had based this book on her life. I really felt like I was seeing the world through a 10 year old's eyes. Sylvia's description of her sexual abuse was poignant; her confusion pulled at me. The story follows Sylvia Butler, a young African-American child who is being raised by her mother. Her mom has mental health issues, which causes her daughter to be ostracized socially. When the mother passes away, her father -- whom she has never known -- comes to take her from Louisville to his home in Alabama. Her father dotes on her, thrilled to find out he has a daughter. For a moment, all seems okay. However, her step-mother is none too happy about the long-over affair that has now come to light, and something seems off about her step-uncle who is just back from the war. Ultimately, tragedy strikes again. Alone and thousands of miles from the only real home she ever knew, she is forced to face the harsh realities of a broken home. What made the story more powerful was knowing it was a fictionalized version of Jackson-Brown's life, which we discussed on my podcast. The horrors in the book were more visceral because there was no way to shake off the fact that the essence of the story sprang from that well of truth. Even as that heaviness floated down and around me, the lyrical prose swept me from page to page and never allowed me time to wallow in the vast emptiness. A very good story of a young girl's pain, sorrow and forgiveness. I've had this book in my kindle for a couple of years and I'm so glad I finally decided to read it. It tells the heartbreaking yet heartwarming story of Sylvia Butler. It's a story of love, hate, depravity, hope and perseverance. Sylvia has endured so much in her young life. Her mother's mental health issues and eventual suicide. Moving to live with a father she didn't know and all she encountered there. She endured so much sadness and brutality in her short life but she rose above it all. What an emotional roller coaster! I started it last night before bed and haven't been able to put it down all day. There's a pile of tissues beside me and I have that tight, hiccupy feeling in my throat. I felt a connection to the MC Sylvia from the first paragraph. The writing and characterization is flawless and beautiful. I gave it 4 stars only because it deals with some very tough issues that make it hard to read. This book is a treasure. Excellent! The characters are well defined. This novel grabs your attention from the start and will not let you go. I began to read it one Saturday morning and 4 hours later completed the book. You end up rooting for the heroine and using up a box of tissues. I highly recommend this book and author and look forward to more of Angela Jackson-Brown's works. Great story, rather abrupt ending. I loved this story. I cried at least twice. However I felt like this incredible build up of heartbreak, love, loss and relationships ended really abruptly, almost as if the author realized her deadline was there and she just needed to end the book. Angela Jackson-Brown is triumphant with her debut novel! I loved every word! Sylvia is a hard heroine not to love and have your heart ripped out with the tragic events that unfold for her only to become a truly remarkable human being herself. After reading this extraordinary book, I can't wait to see what Angela has next for us all to enjoy! If you haven't read it, YOU SHOULD! Set in the South during the '60s and '70s the story unfolds as a realistic portrayal of the times. This could well be about my.friends or me. It is the good bad and ugly of life then. It touches my heart. This book of sexual abuse was gripping because it touched the true emotions of a young girl. I would not have read the book if I had known it was about abuse but once that was revealed, I finished the book as I needed a survivor to emerge and not a victim. Very sad book. This was an emotional journey. I cried and wanted to hurt some of the characters. The story had so many ups and downs. My heart went out to Sylvia. It was so hard to imagine the things she went through at such a young age. What a wonderful book! I couldn't put it down! I had so many emotions while reading it. I would laugh, cry, get angry, and I would want to reach in and pull Sylvie into my arms. One of the best books I've read in awhile in this category. I cannot wait to read her next book! This reminded me of the many books Oprah made popular several years ago with her recommendations on her book list. No surprises here really. A young girl faces terrible tragedy yet somehow comes out stronger young woman. I thought it was well written and compelling enough that it was a quick read. I really enjoyed this book!! Great read!! Painful, joyous, and life-affirming, this soft novel takes you into a world of reality as it can only be seen by an adolescent. I thoroughly enjoyed it. This was an awesome book, I couldn't put it down, I wanted to save Sylvia myself. I felt her pain. My emotions where all over the place in this book. Sad it had to end, wish there was a part 2.